Check out how succulent this steak looks. Well it tastes just as good as it looks too. At $10 you could not buy the ingredients and cook it yourself. This is a 300g Black Angus Steak which comes from the dry age specialists @ Havericks meat. 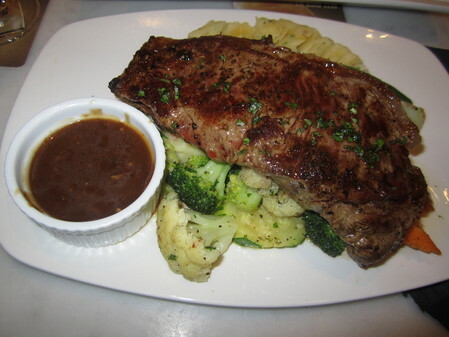 Served with potato mash and well cooked vegies with a choice of mushroom or pepper sauce on the side. Bah, with the vegetarian 24/7. Sometimes you just need a great steak and three veg meal sometimes. This wholesome, good old fashion plate filled my tummy and delighted my taste buds. Oh boy I felt good afterwards relaxing with a good chilled wine to boot. Crown Hotel on the corner of Crown and Cleveland Streets in Surry Hills has several $10 meals. Pub Grub is the food of champions here. You do have to purchase a beverage with your meal, but tat is an added bonus at hotel prices. Head there for dinner after work or enjoy a great meal on week-ends. Looks great! I'll have to check it out.